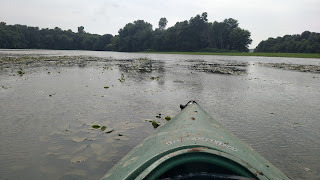 How late can I re-plant soybeans? What maturity group should I plant? Both questions will come with the "It depends....." qualifier. 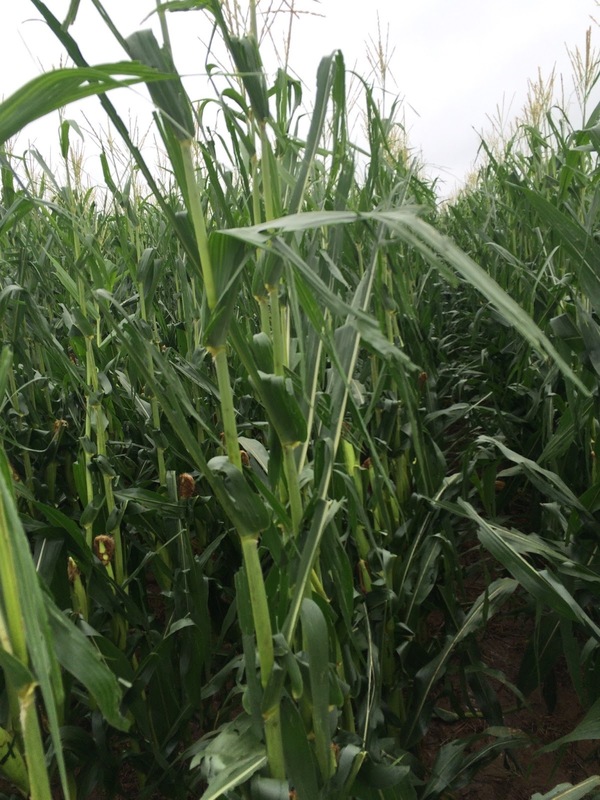 The 2015 growing season has been wetter than normal with reasonable temperatures. Over 80% of the corn crop and over 70% of the soybean crop are rated good to excellent in the most recent USDA crop progress report. This should be a time to celebrate and enjoy the good fortunes to this point. 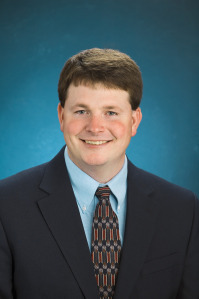 Earlier this month, Dr. Carl Bradley officially joined the University of Kentucky as the Corn, Soybean, and Wheat plant pathologist. Many of you probably already know Carl. He is a nationally recognized and well-respected extension plant pathologist. He recently spoke about wheat diseases at the Wheat Field day this past May and he will be presenting information about soybean diseases next week at the Corn, Soybean, & Tobacco Field Day on July 30. Carl will be stationed at the University of Kentucky Research and Education Center in Princeton, where he already has corn and soybean research plots established. Be sure and welcome Carl when you see him travelling around the state this year!! For more information about Carl please read his first article in the latest issue of KY Pest News. 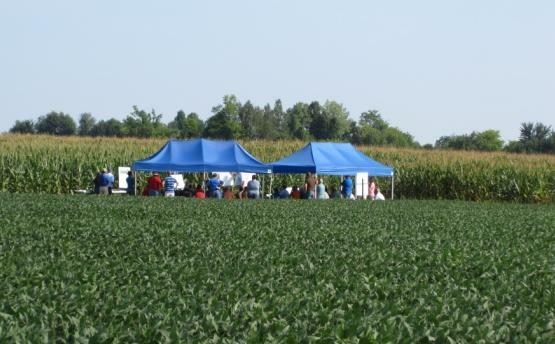 The 2015 UK Corn, Soybean & Tobacco Field Day will be held Thursday, July 30th at the UK Research and Education Center in Princeton, KY. Registration will begin at 7:30 am (CDT) and the tours will begin at 8:00 am (CDT). Big Season for Green Stink Bugs? If you’re not checking for stink bugs in your soybeans you should be. 2015 appears to be producing an extra large population of green stink bugs, at least in western Kentucky. For example, as of July 10, 2015, a total of 2,184 stink bugs have been captured in a black light trap on the UK-REC in Princeton, Kentucky. That is more stink bugs than were captured in all of last year (2014) in TWO black light traps on the UK-REC (e.g. 121 + 695 = 816). 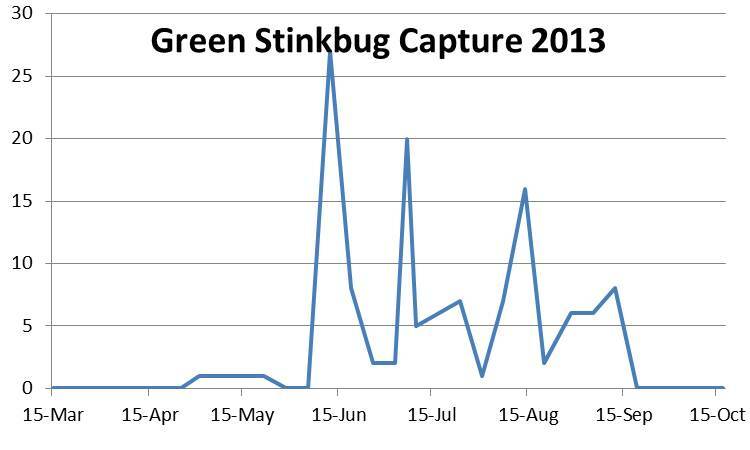 In fact, more stink bugs were captured in the 2015 single trap week ending on June 26th than in all of 2014). However one looks at it, that is a lot of stink bugs. In addition, you will notice a great deal of difference between the captures at the North Farm in Lexington –vs– The UK-REC in Princeton. This occurs almost every year, but is particularly apparent this year. We have seen a decrease in capture since that high, but don’t let that fool you as the numbers will likely rise again. Black light traps only capture adult stink bugs. Because the bugs must be able to fly to the trap to be captured, and juveniles do not have wings, only adults are captured. Normally, we would expect to see three generations in each summer season. Sometimes this produces very distinct populations (See Figure 1.) but often the generations tend to show overlap with one another. Sampling for stink bugs may be done by sweep net or shake cloth. In Kentucky, most of our beans are in narrow rows so the sweep net is the tool most often used. For sweeping, use a 15” sweep net and make 25 sweeps. Then count the number of stink bugs present. Most of the stink bugs will be green but there may also be brown stink bugs. In addition, juvenile stink bugs may be multi-colored. You can tell them from the adults because they do not have wings. Additionally, you will likely see some brown stink bugs whose shoulders come to a very definite sharp point. These are spined-shoulder bugs and are predators. They will not harm the plants. With the exception of spined-shoulder bugs, count all stink bugs as the same. 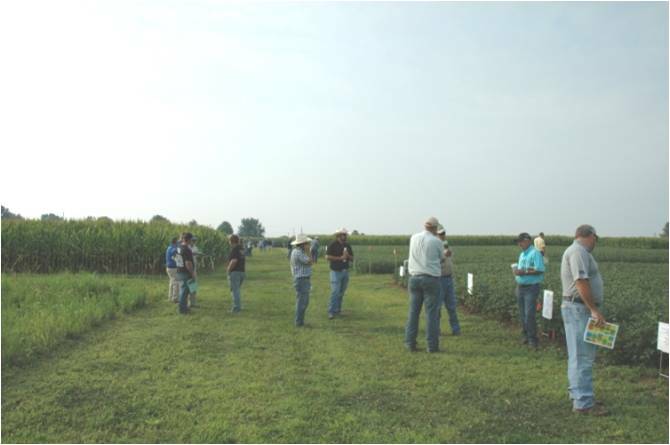 University of Kentucky Extension Weed Scientists are hosting a Marestail Control Field Tour on July 28, 2015 at the University of Kentucky Research Farm in Woodford County. The plots and field is located at the corner of US 60 and US 62 [enter farm gate off US 60]. Participants will be able to come and go as they wish from 9:00 am to noon (EST). Hail damage to corn in blister stage. Heavy rains and winds occurred the July 13 and 14, 2015. Farmers, county agents and students submitted images of the damage that resulted. Each image contains a short caption to identify the issue. Several days are needed before we can fully determine crop recovery and the extent of the damage. More images will be added to this post as they are submitted. Numerous fields of soybeans appear yellow or bright green right now. The symptoms mimic nitrogen deficiency, but the plants are really starving for air to the roots and sun on the leaves. Everyone is thinking about applying some nitrogen to help make the plants greener. But what these plants really need is for sunshine to help partially dry the soils. 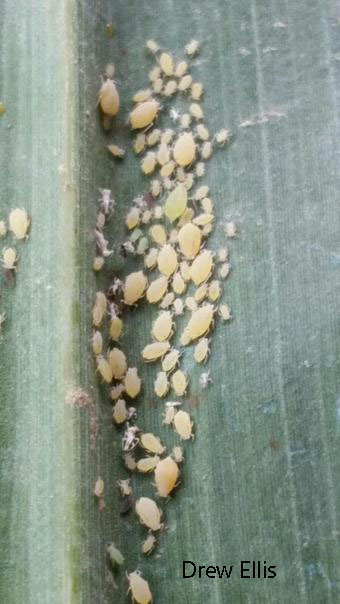 Dr.Scott Stewart (@BugStewart) has tweeted the first discovery of sugarcane aphid (SCA) in Tennessee (07/07/15) at the AgriCenter in Memphis. The aphids were found and photographed by Drew Ellis. Numbers are low, but this does indicate that the pest is moving up the Mississippi River valley. Several of our colleagues to the mid-south have commented on the large number of lady beetles & larvae that are feeding on these aphids, helping to keep the pest in check. A single insecticide application will stop all that help. Do not apply until absolutely necessary! Kentucky producers in counties along the Mississippi River and / or counties contiguous with western Tennessee counties are most likely to see this pest. SCA was not reported in Kentucky in 2014 but was collected in western Tennessee counties and in counties in the Missouri boot-heel. It is not a foregone conclusion that SCA will reach Kentucky, but it is an important enough pest to keep on your watch list. Grain Sorghum producers / consultants / scouts, that are Twitter followers are encouraged to follow Dr. Scott Stewart, Univ TN, (@BugStewart) along with Dr. Gus Lorenz, Univ. AR , (@guslor77) and Dr. Angus Catchot, MS. St. Univ. (@acatchot). They will be working to manage this problem in their states before the pest gets to Kentucky; if it gets to Kentucky. Considerable rainfall has accumulated throughout most of Kentucky. Since June 1 the average rainfall for the Commonwealth is more than 3 inches above normal, with almost 2 inches of that falling in the last 7 days. There are areas of KY that have received 10 or more inches in the last 3 weeks. 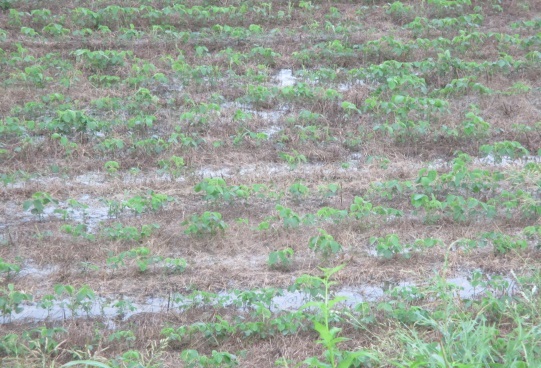 Given these conditions many producers must decide whether to plant and in some cases re-plant soybeans once fields dry. When considering whether to plant late or re-plant two things come to mind.